< a>Looking to "Change Your Weighs?" Go here. You have found Home Bodies in-home fitness training! We serve clients all throughout New England for in-home visits. We also offer online training for those looking for program design, exercise guidance and accountability worldwide. Gina Paulhus, author and CEO of Home Bodies since 2004. Testimonials from those who's lives have been changed by working with Home Bodies. Learn how you can get fit - once and for all! Receive a Price Quote for your very own personal trainer who comes to your home or office. Check out our Satisfaction Guarantee. Other trainers don't dare offer something like this. Danielle Rocco works on her core strength and is learning how to keep her body safe during exercise. All of these workouts can be performed right in your home with little to no equipment. You will love the results - and you'll especially love the convenience! Find out how simple it is to shed excess weight and tone your body. All you need is the right nutritional approach for your body type and a workout plan that's perfect for your individual body. We prioritize health and wellness and are able to work around any injury or limitation you might have. You'll find plenty of secret fitness tips and tricks here. Plus, our professional trainers love to work clients to design fat loss and strength building programs and teach you exclusive personal nutrition strategies. It seems that half the battle with getting fit is the inconvenience of it all! After a long day, who wants to drive to the gym and fight for the treadmills? Fortunately, there is a better solution--with the proper guidance, you can enjoy a safe, effective home workout routine that really gets results..
and what you can do to REVERSE the process. Dig into these articles and more! *If you don't know where to start, here is a great place: Learn the 7 Tips you need to know to raise your metabolism for life! *Be sure you stay motivated with your diet and fitness goals by subscribing to our newsletter. *If you would like to learn a simple, quick, and effective home workout, please visit: Home Workout You Can Use Today! In-home personal training services and program design is available for those in MA, NH, RI, ME and CT at this time. Online program design and accountability programs are also available worldwide. Hire your own in-home personal trainer today! HomeExerciseCoach.com is owned and operated by Home Bodies in-home fitness training. We post special insider tips and tricks daily to keep your mind in the game! Subscribe to our E-Zine. Receive Special Offers. Our online personal training services is officially out of beta. We're ready to take on some new clients who are ready to change their lives. Submit a request for an in-home personal trainer price quote. We'll let you know rates for an in-home trainer to work with you. Personal Trainer in Boston, in other parts of Massachusetts, or in NH or RI? Looking for a personal trainer in the Boston or other parts of MA? Also serving NH, Maine, and RI. Get a price quote. Looking for a Personal Trainer in Massachusetts, NH, ME, or RI? Personal trainer in Massachusetts guarantees that you reach your weight-loss or body transformation goals! 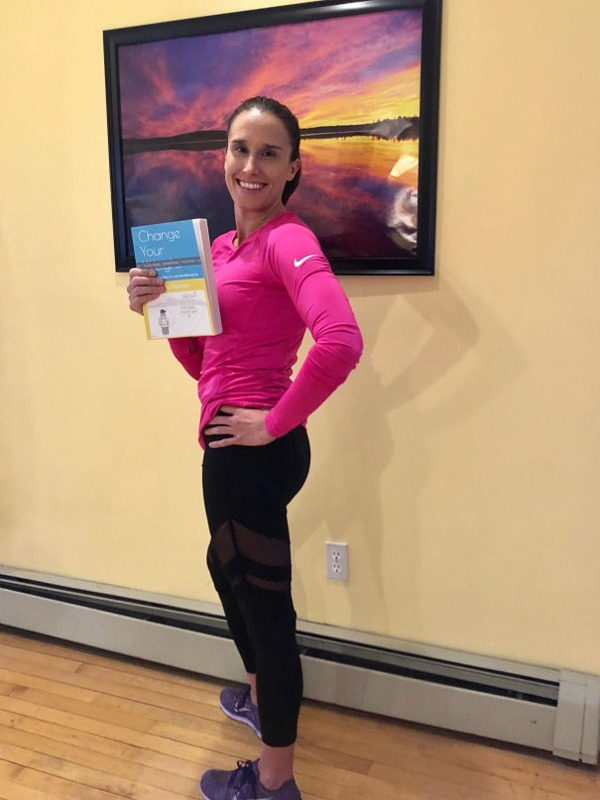 Personal trainer in Massachusetts can help YOU like she's helped so many get in shape. Home Bodies in-home personal training will help you reach your goal with a home workout. Frequently asked questions about Home Bodies personal training are answered here. Home Bodies Fitness Programs by Gina Paulhus allow you to get in great shape at home. We have programs for all goals and budgets. Looking for a personal trainer in NH to come to your home? Home Bodies is your solution! Simply get a custom routine or see the trainer regularly--its up to you. Personal trainers in Maine come to your home to design a routine for you or work with you on a regular basis. Personal trainers in ME will help you get in shape fast. Home Bodies Clients of the Month are great fitness examples for all of us! Home Bodies clients of the month are very special people who have been successful with their health and fitness endeavors. Read all about them here, and get inspired! The Seven Secrets Personal Trainers Know for losing fat and keeping it off for good. Weight lifting exercises, a good diet, and cardio are all very important, in that order. Subscribe to Gina Paulhus' popular monthly Newsletter, filled with great health, fitness, and weight loss tips, coupons for products and services and more! Free fitness advice from Gina Paulhus, Home Bodies, and homeexercisecoach.com. Weight lifting, cardio, diet, and supplements are all covered. See all episodes of The Home Bodies Fitness Show! At home workouts and nutrition strategies are discussed. See our catalog of free home exercise videos. Upper body videos, lower body videos, core and foam rolling videos are all here. Health, fitness, nutrition, and weight loss updates as well as client news for Home Bodies in-home fitness training. Contact homeexercisecoach.com, Home Bodies in-home fitness training and consulting, and Gina Paulhus. You can reach us 24 hours per day 7 das per week for diet and fitness help. homeexercisecoach.com is the official site of Home Bodies, the premier in-home personal training company in New England.